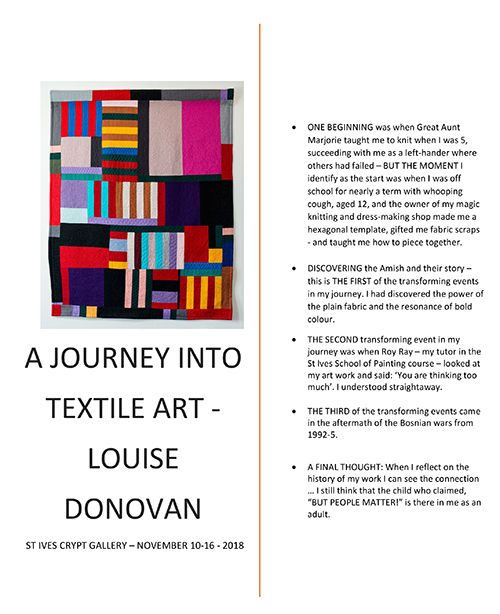 Louise Donovan - A Journey Into Textile Art. An Exhibition of Hand Made Quilts. Saturday 10th to Friday 16th November 2018. My work comes out of my life journey. It is not based on an identity with an artistic school. My journey into my creative life has had clear starting points and then three key factors shaping and developing it. My creative life is inspired by people and their stories. 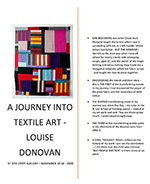 "Louise Donovan - Textile Artist - My Story"
are now available for purchase online. Catalogue: 30 pages - with the story of all 14 quilts featured in the exhibition, plus a full page colour photo of each. 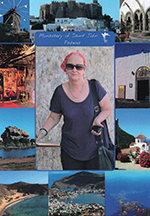 My Story: 16 pages with colour photos. The cost for both is £12.50 - which includes first class postage to UK addresses. Worldwide postage available - contact us for costs.